Bangor's Eliza Jansujwicz (right) gets a foot on the ball ahead of Lewiston's Sara Robert (14) and Kajha Gagnon (obscured) during the Rams' 5-0 soccer win in Lewiston Sept. 3, 2017. All-Region and All-State soccer midfielder Eliza Jansujwicz said it was a difficult decision to make. 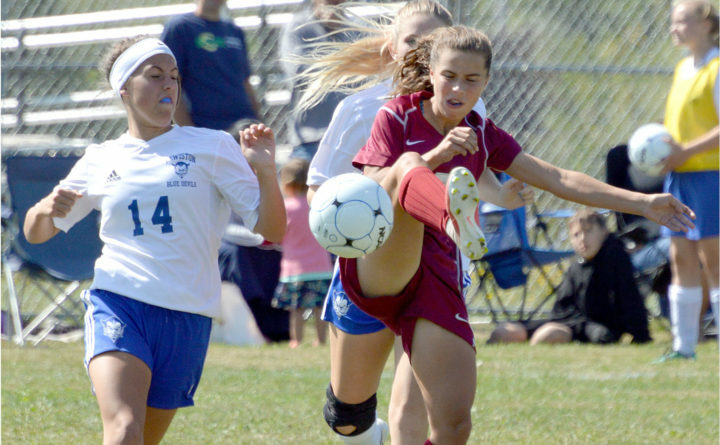 But the Bangor High School standout has decided to play for Seacoast United’s U.S. Soccer Girls Development Academy’s Under-17, so she won’t be playing for Bangor High this fall. It is the first year of the partnership between Seacoast United, a club team based in Epping, New Hampshire, and U.S. Soccer’s Girls Development Academy. Jansujwicz is entering her junior year and will continue to attend Bangor High, but will commute 202 miles one way to Epping a couple of times a week for practice and again on weekends for games. “It’s unfortunate for us and good for her,” head coach Johnson said. “She’s one of the most talented players we’ve ever had. She’s tenacious and her skills are second to none. Her passing, speed of play and vision of the field (are exceptional). And she never got tired. Johnson said Jansujwicz dished out a lot of assists last season and significantly upped her goal total to “12-to-15” after scoring just a few her freshman year. “She has a nose for the goal. She was real hungry to score last season,” said Johnson, whose Rams reached the Class A North finals each of the last two seasons only to lose to eventual state champ Camden Hills. She said she has been blessed with a “wonderful, supportive mom (Jessica)” who drives her to practices and games. She often does her homework in the car. She has played with Seacoast United for five years and said she is used to the commute. If Jansujwicz decides to return to play for Bangor High her senior year, she will have the chance to play with her sister Sasha, who will be a freshman in 2019. “At this point, I’m just going to take it one day at a time. We’ll see what happens next,” Jansujwicz said. Johnson said Bella Varisco, who will be a senior, juniors Rowan Andrews and Mackenzie Lambert, and sophomore Sophia Mullins are possible replacements for Jansujwicz. “It’s going to be wide open. We’ll move people around. We had a good bunch of young talent last year,” said Johnson, who added that he is getting used to losing great players prematurely as midfielder Anna-Maria Dagher (knee) and back Lauren Young (broken leg) each missed virtually their entire senior seasons in recent years.